It's that time again, dear readers, for the Nintendo Download Update in Europe. This week has brought us two retail titles and a few interesting download-only games on Switch, while a promising 3DS eShop game and various DLC packs across platforms are also up for grabs - along with the usual batch of discounts. Let's get to the details. Mario + Rabbids Kingdom Battle (Ubisoft, €59.99 / £49.99) - A mash-up that caused some concern when originally rumoured and then leaked, this turn-based strategy has done a good job of winning over sceptics. It has a lot to offer with exploration and puzzles supplementing the battles, and delivers a unique and smart turn-based tactical experience. 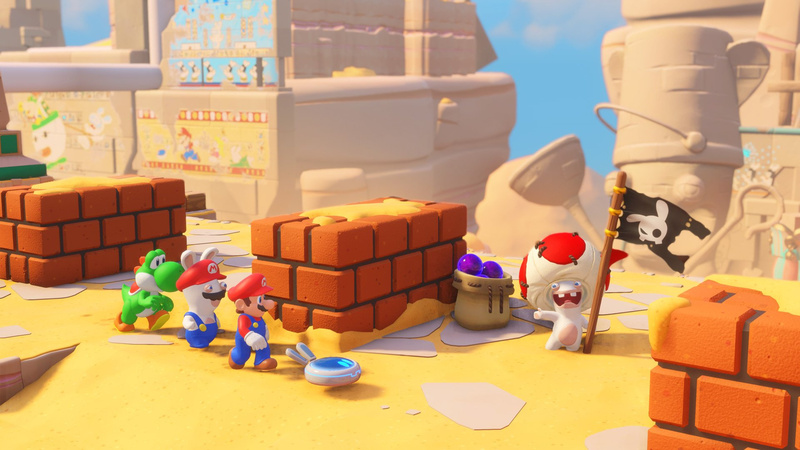 We loved it in our Mario + Rabbids Kingdom Battle review. Azure Striker Gunvolt: Striker Pack (Inti Creates, €34.99 / £31.49) - A combo offering that includes both original 3DS games and all DLC; enhancements include HD visuals (in some respects), 60fps performance and HD Rumble. Our review will be with you later today. 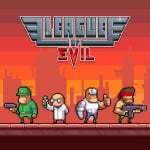 League of Evil (Ratalaika Games, €7.99 / £7.19) - A retro-styled action game with 140 levels to take on, it also has a level editor for sharing creations and the ability to download community levels from across platforms. It's addictive, fun and brutally challenging, or so we said when giving it a recommendation in our League of Evil review. 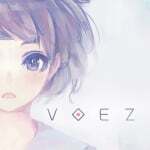 Zed Blade (HAMSTER, €6.99 / £6.29) - In this frenetic horizontal shmup you have the choice of three craft with different speeds along with customizable weaponry. After your choices have been made it is time to make a trip around our solar system, turning everything that moves on the screen into scrap metal. We'll bring you a review of this ACA release soon. Sky Ride (Mutan, €6.99 / £6.29) - Previously released on PS4, the idea here is that you fly through battlefields fighting various futuristic foes. Unfortunately this one is very rough around the edges, as we explain in our Sky Ride review. 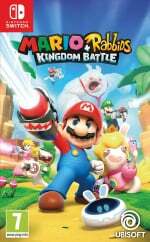 Mario + Rabbids Kingdom Battle Season Pass (Ubisoft, €19.99 / £15.99) - Initially includes some new weapons, with additional challenges and story content planned for Autumn 2017 and 2018. Shantae: Half-Genie Hero - Pirate Queen's Quest (WayForward, €9.99 / £8.99) - The story takes place just after the initial one, and will see the now-playable Risky going on a quest to find five new parts to add to the dynamo so she can rule over Sequin Land. Parascientific Escape - Crossing at the Farthest Horizon (CIRCLE Entertainment, €5.00 / £4.99) - We rather enjoyed the first two games in this series, and this final part brings the stories together while hopefully giving us more of what was rather good puzzle-based gaming in its predecessors. That's your lot for this week - let us know what you'll be downloading in the poll and comments below. You guys will enjoy Mario Rabbids! Kingdom Battle, Zed Blade and the Shantae DLC for me. Good week overall. This week finally shows it will Inti Creates hate European fans or not. Azure Striker Gunvolt: Striker Pack arrives, but seems to be only for Switch. So 3DS users are again forgotten and let me guess the Switch version comes with the latest updates while the 3DS version is never going to be updated? I so hope Nintendolife would just ask Inti Creates directly that why do they do this? Why do they hate the European 3DS fans so much? @Bunkerneath I was in the same boat, but Miyamoto endorsed it and the head developer was practically in tears when it happened. Then I saw gameplay and I know I like xcom so I figured I'd give it a shot. I'm glad I did, this is possibly the best Mario spinoff I've ever played. The Rabbids that team up with you are actually very funny! The enemy rabbids aren't so bad either, and they are so expressive! I'm not used to seeing characters in a Mario game emote so much, it's wonderful! It's a very charming and challenging game, I do hope you give it a shot some time... And this is from someone who hated the game as soon as that pic was leaked of Rabbid Peach. I highly recommend Mario+Rabbids, it's sooo good. Yikes, I wasn't expecting that price for Azure Striker. Not as many people getting M+RKB as I thought they would. Will wait for the physical Switch release of Gunvolt Pack. Will probably pick up Mario+Rabbids as soon as I can afford it, but physical copy (which is also cheaper for me). 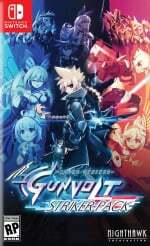 So Gunvolt is definitely getting physical? Been enjoying Mario + Rabbids since last week. Lol at that Gunvolt combo price. Pretty sure I got one of them on 3DS for like a fiver. Maybe Gurumin 3D while it's discounted. I'll be picking up Mario + Rabbids and Azure Striker Gunvolt later in the year. I'm planning to get the physical release of the Azure Striker Gunvolt Switch pack, since I was planning to get that for 3DS but they never gave it an EU release. €80 for full Mario & Rabbids game lol. Mario + Rabbids but gonna wait for Gunvolt's physical release later this year. 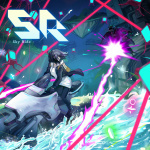 @RainbowGazelle I got it when it was discounted before, but I was really disappointed. 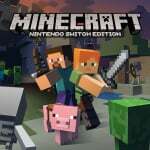 It has many, many features that sound really fun on paper, but overall the level design and fioght system is very bland, the game runs horribly (music stutters on load screens, enemies and NPCs move at a very noticably worse frame rate than you, the physics can be very finnicky), also the 3D is almost non-existent... It has its moments, but I found it very mediocre. Is there a difference between Risky Mode and Pirate Queen's Quest? Why do they have different pricings? Because I have tha game on Wii U, and I wouldn't be happy if I got a lesser mode because of that. Lol, the Shantae dlc is cheaper on the Wii u! I didn't like Shantae and the Pirate Curse. I think that the level design is very cheap with several enemies crossing their attacking patterns randomly and the metroidvania sections were very confusing. This is why I haven't bothered with Shantae Half-genie Hero, what are the differences with the previous game? EDIT: I recommend Sonic Mania. I would think that's to get people over to the NEWER system, the Switch. I'm sure the developer would be more than happy to update the 3ds version of course, but I'd say Nintendo said no to that. 3ds is well on its way out, no matter whats coming in the next week's and months for it. It's just part of business really. All about making money. I would say that would be impossible that Nintendo says no to an update when the devs updated the North American version without problems a year ago already. NoE is always really open to dev talks compared to the NoA operations. Europeans however never got the so called Steam version update with the Japanese language and uncut dialogue etc. Devs also have promised to release it in Europe but haven't done that during all this time. This from their own blog. It's not business of making money if you make your paying fans hate you. I at least will never buy any of their games because of this behaviour towards customers. ASG and the missing Striker Pack (which also released in North America a year ago) and their shoddy developing of Mighty No 9 sealed that boycott deal. If I would've known how they operate I would've never bought the first ASG from the eShop. @Krisi Hmm. Thanks for the advice. Were astro bear party? Its been on eshop for 3 weeks with 31st release date anf now it not out? I'm tempted by Gurumin 3D, even though I have it on PSP. Think it will be easier to control on the 3DS with the circle pad. @BlueOcean Really? I actually thought Pirate's Curse was easily one of the best games in the past few years, and definitely the best of the Shantae series. Pirate's Curse is pretty different, though. It still does have Metroidvania elements, but the stages are much more linear, and there's a much bigger emphasis on actual platforming. Because of this, there isn't even a map like in the previous two games. The story also feels pretty much like episodes from the TV show. Overall, I would say it's the second best game in the series. @Krisi Yes, I bought it because everyone recommended it but I didn't like it. Not even the music which although catchy is tiresome. Also, the story and script are a bit stupid. I will try Half-Genie before buying it. I want to get Wonder Boy: The Dragon's Trap. That one looks awesome and I liked some of the old games that I've played recently. @Kolzig ah, I get you now, yeah that's s**t.